You are here: Home / What is the welcome package of Bob Casino? Bob Casino is a cool place to play some slots, picking from the generous choice of gaming providers. There are also quite a few live dealer games – powered by Ezugi and Evolution. Its unique atmosphere is only likely to add to the appeal, but what all players want to know is what kind of bonuses and promotions they can look forward to. Bob welcomes all new players with 10 no-deposit free spins and three deposit bonuses, giving you 140 free spins + €/$500 in cash in total. Minimum deposit amount is €/$20. 10 free spins with no strings attached – you can get them straight after registration, but they do need to be activated in your account. First deposit bonus at Bob’s is a 100% match up to €/$100, plus 100 free spins for Boomanji, credited as 25 free spins every day for 4 days. Second deposit bonus is 50% up to €/$200. No free spins for this one. 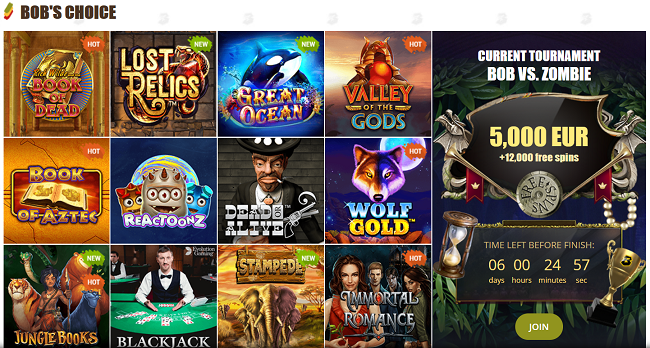 Third deposit bonus is once again 50% up to €/$200 + 30 free spins for The Tipsy Tourist. All deposit bonuses and free spins must be wagered x40 before you can withdraw any related winnings. For all deposit spins, the maximum bet amount is €/$5, for as long as you have the active bonus. As always, only slots contribute 100% to the wagering requirement, while table games contribute only 5% and live dealer games – nothing at all. If you enjoy a particular set of slots, please keep in mind there are a few that do not participate in any promotions, and therefore playing them will not have any effect on your bonus wagering. Please make sure you check for that before activating your bonus. As any self-respecting online casino, Bob has a VIP program aimed at players that like feeling special and making some extra cash as they keep playing. There are a total of 22 levels at Bob’s – which makes it more fun, as you don’t have to wait for months for another bonus to fall into your lap. To get to each level, you need to earn a specific number of special points. For instance, to get to the first level, 20 BPs are required. With the exchange rate of €/$12.5 for each BP, that means you need to wager €/$250 to get there and be rewarded with 10 free spins. Starting from level 5, you get cash prizes in addition to an increasing number of free spins. The last 22nd level requires 300,000 BPs – and you get €/$10,000 for all your hard work and incredible luck. All cash prizes and spins come with a wagering requirement of x3.